How is a Roof of a Home Framed? The roof goes up with amazing speed on our home. The choice for a gabled roof (With two sides) pays off in quick an uncomplicated construction. Each truss is pre-constructed at the factory for our home and is easily place on the roof with a small crane. Each rafter is then attached to the roof with steel tabs to secure the roof down from high wind. The roof also overhangs the edges of the house to allow airflow through the ridge vent at the top of the roof. 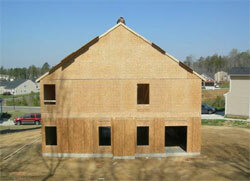 The roof is then sheathed with OSB for rigidity and a flat surface for the asphalt shingles. The roof is an integral part of the home acting as the first line of defense against weather, heat, and other harmful debris. If you want your home to provide you and your family the best protection it should be able to give, you must make sure that all aspects of construction are covered seamlessly from the foundation to the roof. If you are currently planning on renovating your house or a new homeowner is overseeing your home's construction, knowing the basics of house construction will prove very valuable. Here you will learn about an elemental facet of roof construction-framing the roof. Most homeowners today prefer purchasing trusses for their roof frame. These pre-built frames can be ordered from home centers or lumberyards and the finished product will be pre-made at a warehouse and readied for delivery in two to three weeks. Installing this type of roof frame is simple. Trusses are pre-fit and labeled before they arrive on site. It is like putting a giant puzzle together with a little help from a boom truck or lull to lift the trusses into place. Ease of building and speed is the reason why trusses are getting more and more popular these days. Once your ordered frame, built with the proper measurements and specifications arrives and the walls of your home are plumbed, straightened, and squared, you may begin installing trusses. Mark all cap plates where the trusses will sit first before raising the frame to position. Do the marking using 24-inch intervals, making sure the scoring is precise. When you have finished marking the points, prepare to lift the trusses up. Usually, the maker of the truss will throw in two gable end trusses to the pack, which are assembled accordingly to be able to provide adequate support to the gable end sheathing. Raise one end of the truss making sure it is resting on the cap plate's outer edge. Nail it in place. Then fasten the brace from top to bottom keeping the truss plumb secure and braces screwed well into stakes thrust into the ground. 1. Prepare the necessary tools. You will need the following equipment: Plywood sheathing, circular saw, ridge board, rafter studs, nail gun, pencil rafter, plumb post, 16-pennynails, bevel square, and rafter horses. Make sure to provide more than your estimate bulk just in case oversights occur. 2. Line the ridge board carefully and support it by bracing a plumb post to it. Once you are done, attach the rafters to the board. Note the spot where the rafter and ridge joins and take its measurement using a bevel square. Then using rafter horse's line and cut the rafters to equal pieces. 3. Forge beak-like notches on spots where the rafter rests on the outer walls' double plates. Make sure that all pieces fit firmly. To attach rafters in pairs, begin with the gable edges until they are adjoined in the middle. Fasten them securely using 16-penny nails. Repeat this process until you reach the other end of the roof, leaving 6-inch spaces in between rafter studs. 4. Position the ridge board in place and start nailing from the top going to the sides using 16-penny nails. Stabilize the roof by installing and nailing plywood roof sheathing onto the rafters. When undertaking high-risk construction jobs like framing the roof, always take safety precautions. Wear protective gear and harnesses. Know your project well to minimize the occurrence of errors and accidents. Make sure to have help to attempt this large construction project. This is the type of project in which you will need to be prepared fully before beginning. With the proper tools and knowledge, your roof can be successfully installed.